JARR researcher Dr Liam Herringshaw talked to BBC Radio Five Live on Thursday April 9th (http://www.bbc.co.uk/programmes/b05pl7lw) about the story that ‘100 billion barrels of oil’ had been found in Jurassic rocks beneath Sussex: http://www.bbc.co.uk/news/business-32229203. Liam explained that the company were targeting a shale-dominated succession in the Upper Jurassic, and in particular the Kimmeridge Clay Formation. He noted that ‘the Kimmeridge Clay Formation does have a lot of natural variability in it’ and that he would be ‘cautious’ about predicting such large oil resources on the basis of a single test well in a licence block 55 square miles in size. How shales fracture is a topic of great significance to any understanding of the viability of fracking. Research on the geomechanics of Jurassic shales, led by Dr Jonny Imber and the JARR team, has been published in the AAPG Bulletin, as part of a thematic issue on the fracturing and faulting of shale reservoirs (http://aapgbull.geoscienceworld.org/content/98/11.toc). Jonny’s paper examines the inter-relationship between shale composition and shale behaviour, and demonstrates that there are numerous variables to consider. Differences in clay content between individual bed-sets affect their pore fluid pressures and principal stress directions, and thus their geomechanical behaviour. Variations in fracture density are therefore observed in beds of different composition; high clay content tends to be linked with the development of bed-parallel natural fractures. Jonny’s research shows that natural fractures in shales are heterogeneous over distances <15 km, a scale smaller than that of many UK licence blocks. 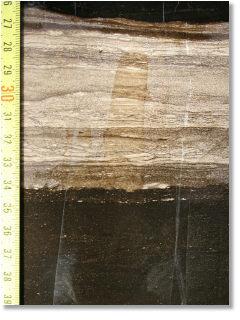 These findings have significant implications to the understanding of variability in shale successions, and of how they will fracture when they are hydraulically stimulated. Dr Howard Armstrong talked about the science of shales and fracking, and chaired a round table discussion group, at the Shale World UK meeting in Birmingham: http://www.terrapinn.com/conference/shale-gas-uk/speakers.stm. Dr Imber is also presenting at the 8th Petroleum Geology of Northwest Europe conference, which will be held in London from 28th-30th September: http://www.petroleumgeologyconference.com/. Dr Liam Herringshaw talked about “The Science of UK Shale Gas: Fracked or Fiction?” at the Petex 2014 meeting at the ExCeL: http://www.petex.info/. As part of the 2015 ‘Year of Mud’ activities, members of the JARR team, together with colleagues from Geospatial Research Ltd (http://www.geospatial-research.com/), are offering a fieldtrip to the Yorkshire Coast. This will run on September 15th and 16th. Further details can be found here. In May, participants in the JARR (Jurassic Analogues: Resources to Reserves) project gathered in the Wessex Basin to discuss the latest research into fractured and hybrid shale oil systems. The focus was to address the nature and controls on depositional heterogeneities, diagenesis, geomechanical properties and natural fracturing in hybrid shale-oil resource systems. Hybrid shale-oil systems are highly heterogeneous on scales ranging from microns to kilometres. Quantifying and explaining these heterogeneities at appropriate scales are essential tasks generating the fundamental knowledge required to improve both the locating and recovery of the resource. The workshop had two aims: 1) to apply our causal, dynamic, tropical-subtropical climate model to outcrop observations at Lyme Regis and Kimmeridge Bay; and 2) to study the variability and origins of natural fractures. Despite being of different ages and distinct depositional settings, these sections have a mix of organic-rich, and organic-lean, carbonate-rich mudstones. Both provide key information on the character, stratigraphic variations, and geographical extent of potential sweet spots in hybrid systems. A particularly important question was inter-relating lithology (at sub-metre scales) to the character of the natural fractures. A better understanding of these factors is essential to reducing exploration risk and cost. The next JARR workshop will take place in late August/early September. Before then, members of the project, in association with Geospatial Research Limited, will be running a field workshop to the Cleveland Basin in July. This trip will study the deposition, diagenesis and geomechanics of an oil-mature Early Jurassic shale system. Please contact Dr Susie Daniels (field_trips@geospatial-research.com) for more details. In February 2014, the JARR (Jurassic Analogues: Resources to Reserves) project was launched with a workshop at the British Geological Survey. The meeting brought together participants from academia and industry to examine organic-rich mudstones of Jurassic age and discuss the latest conceptual research ideas into basin-scale shale depositional systems and geomechanics, and their implications to better understand sweet spot distribution in shale successions across offshore and onshore UK. The workshop began with Dr Howard Armstrong (Durham) introducing JARR and explaining the aims of the project. Howard examined conceptual models of shale gas sweet spots, and emphasized the need to better understand what the essential ingredients of a quality unconventional reservoir are, and what controls them. Developing this theme, Prof. Tom Wagner (Newcastle) used detailed geochemical datasets from Cretaceous sedimentary rocks in the Atlantic Ocean to explain the importance of palaeoclimate. The atmospheric Hadley Cells, particularly the Inter-Tropical Convergence Zone (ITCZ) – a prominent atmospheric feature defining the extremely humid, core tropical zone – play a key role in the distribution and composition of marine black shales. Understanding how the dynamic behaviour of the ITCZ over orbital and longer time-scales translates into sedimentological and geochemical heterogeneity of marine shales has profound implications to better understanding and predicting the location of ‘ideal’ organic-rich shale depositional conditions. Using new data from the Lower Jurassic, Dr Jonny Imber (Durham) then looked at the natural fractures and geomechanics of shales. Of particular importance was the question whether natural fractures occur preferentially in clay-poor shales. With the geomechanical and palaeoclimate models in mind, the group then examined the Kimmeridge Clay oil shales in core. Variability of key parameters (lithology, TOC, clay mineralogy, silt content, fractures) was examined, with the challenge of identifying sweet spots. The core provided an opportunity to test new models of mudstone deposition, and to investigate the possible control of sedimentary facies and mineralogy on “brittleness” and natural fracture development. After the group had examined the core, Liam Herringshaw discussed its lithological and sedimentological variability and the possible interpretations, particularly in light of the Hadley Cell climate model. Jonny Imber then discussed the fracture patterns observed in core, their relationship to lithology, and the potential implications. Howard Armstrong wrapped up the workshop by applying the Hadley Cell model to the Carboniferous, making predictions of how the distribution of organic-rich shales may vary laterally and temporally. It was concluded that the Hadley Cell model has significant implications for understanding the prospectivity of shale gas plays in the UK and Europe. Over the next few months, JARR will host a series of core and field workshops to further test and apply generic understanding of multi-scale controls on black shale distribution and properties, with the power to be developed as predictive tool for shale sweet spot identification. Field workshops are planned to the Wessex Basin (late April 2014) and Moray Firth (July 2014). Thanks to funding from the NERC Oil and Gas Catalyst grant, there is no charge (beyond travel and subsistence) for industry participation in any of the JARR workshops.